On Sunday night, Elon Musk’s SpaceX will launch “Zuma,” a mysterious government spacecraft of unknown purpose, on one of its partially-reusable Falcon 9 two-stage rockets from Launch Complex 40 at Florida’s Cape Canaveral Air Force Station. The exact time of the launch has yet to be set, though SpaceX has set a two-hour window beginning at 8pm ET. 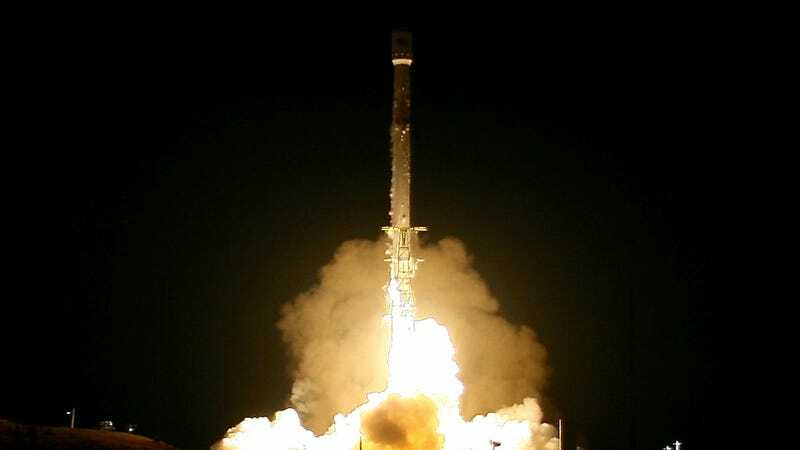 Zuma’s launch was delayed two months for what SpaceX called “fairing testing,” referring to the part of its rockets that house the payload, and a few additional days after extreme weather hit the East Coast. It wasn’t until earlier in January that the company was able to confirm a hard time or date for the launch. Nothing is really known about Zuma other than that it was commissioned by Northrop Grumman for an unknown customer and that it’s “targeting an insertion position somewhere in low Earth orbit,” per TechCrunch. So it’s certainly not unlikely that it’s designed for military or intelligence purposes; per USA Today, amateur satellite watchers have speculated Zuma is related to earlier launches of spacecraft that appeared to be surveilling other spaceborne objects. SpaceX tweeted that weather conditions are now 80 percent favorable for Sunday, and that it’s completed yet more pre-launch testing, so all looks as good to go on paper as firing a giant canister of rocket fuel and secret technology into the sky can be. According to Space.com, the launch will involve a re-entry attempt by the first stage of the Falcon 9 rocket at Cape Canaveral’s Landing Zone 1—SpaceX has pulled off 20 such re-entries previously. If all goes well and without any kind of unplanned explosion, the reusable part of the Falcon 9 should touch down at around eight minutes post-launch. It’s also SpaceX’s third such launch for the U.S. government, with previous payloads including a spy satellite and the X-37B space plane. SpaceX has scheduled a live feed of the launch on YouTube (we’ve embedded it below!) but you can also watch along on Space.com’s webcast page. It’s likely the feed will go live around 7:45pm ET, a few minutes prior to the launch window.